A copying error changes the meaning of Hamlet. Copying errors are pernicious. Once introduced, an error can be used as a template for a new copy, and that bad copy can be copied again, and yet again, until soon the error is everywhere. I’ve identified many copying errors in different versions of Shakespeare’s plays. In one variant of The Taming of the Shrew, for example, L becomes T, and Bianca declares that she will “took” on her books and instruments rather than “look” on them. Once in while, though, an error will be introduced that actually makes sense. And these kinds of errors are really the most interesting ones. And the most dangerous. The best example I’ve found comes from Hamlet. 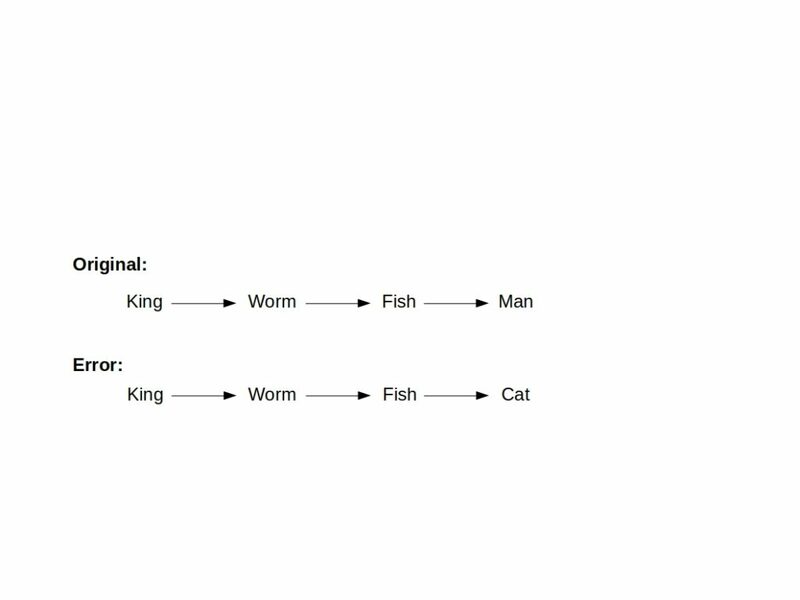 In the first version, worm eats king, fish eats worm, and man eats fish. But, in the mutant version, the final recipient of the feast is a cat. This second food chain, like the first, is 100% plausible. Cats DO like fish, after all. In fact, they are famous for eating them. So: what could be more reasonable? Reflecting this plausibility, this new version is now INCREDIBLY widespread. Reasonable people fixate on this section, and they quote it again and again and again and again. There’s another weird twist to the problem. Because, to a certain kind of person–the cat lover–the mutant version may be even more attractive than the original. Where did this cat come from? Perhaps Google Books is to blame. Certainly: it is now on the wrong side of the problem. This cat is an interloper. It should not exist. And so we are, of course, obligated to resist the error, wherever we find it. And yet….There is a weird charm to this new version. And something very cat-like. Shakespeare never intended this cat. But it crept it in anyway, unwanted. And now that it is there, in everyone’s lap, rubbing its head persistently against our hands, sometimes, just sometimes–in spite of ourselves–we find ourselves petting it anyway.